Granite Countertops installation and fabrication costs can significantly affect the final price of your new granite countertops. Generally, the more complex the shape of the countertop and particularly the shape of the finished countertop edges, the higher the price will be. Fortunately, a single thickness plain polished edge makes an excellent appearance and most customers choose this standard. Occasionally, a customer will want a custom granite countertop edge pattern, possibly to match the edge to detailing on the cabinetry, and this can also be done. But keep in mind that if the granite fabricator has to buy custom cutting bits, he will add their cost to the price. Granite countertops are usually polished to a high gloss finish. Granite countertop installers may sell finished pieces, but granite slabs are always sold intact. The price of the granite countertop includes the cost of transportation, making field measurements and templates, cutting, polishing, delivery, and final installation. The total material required is determined by the layout and the amount of waste. The fabricator will try to lay out each job so as to minimize waste yet maximize the natural beauty of the veining and pattern. 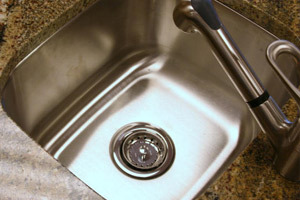 There are two types of sinks used with granite countertops, referred to as drop-in and under mount( shown). If a cook top is to be mounted in the granite, be sure that there is room inside the cabinet to hold the top and any pop-up vents that will be installed with it. If the top is replacing an existing top, be aware of the differences in thickness of the two materials. Any upper cabinetry that currently rests on the existing top will probably not reach the granite, so adjustments will have to be made. Allowances must be made for the thickness of a back splash when measuring for the placement of these fixtures. If thicker granite is used, a wider space will be needed. The sink and kitchen appliances built into the countertops like a cook top or drop-in range must be on the job site before a template can be made. Counter tops are measured in much the same way as other solid surfaces. First, a template must be made to use as a pattern. For this reason, base cabinets must be permanently anchored in place before measurements can begin. They are to be installed only by the fabricator who will assume responsibility for a proper fit. Improper installation of kitchen countertops may void the manufacturer's warranties and result in damage to your fine surface or other areas of your kitchen, such as cabinets, drawers, sinks, and fixtures. It will take 3 to 4 weeks to complete the installation after measurements are taken, so be sure to allow sufficient lead time for the project to be completed. If anything goes wrong during the fabrication process, or if the top is damaged and has to be replaced, that time will be extended. Because granite is usually sold in slabs no more than 10' long, most countertops will require at least one seam. And since granite is sold in rectangular pieces, using seams may also reduce the costs, as in an 'L' shaped corner. Sometimes a seam can be placed at a sink bowl to make it less conspicuous. The back splash is usually made from the same granite used for the counters, but it can be ceramic tile, or some other product. It may be attached to the counter or to the wall, but in either case the seam between the counter and the back splash will be sealed with caulk. The standard height for a back splash is 4" although they're frequently made higher if the customer desires. A tall back splash is sometimes used behind the kitchen range or sink to protect the wall from grease splattering or other stains. This may be modified to suit personal taste, but it must be stipulated before the template is made. Granite can be cantilevered up to 14" if it's a large piece with sufficient support on the fixed end. It should never be cantilevered where it might receive excessive stress, however, such as where someone may be tempted to sit on it or use it as a step stool to change a light bulb. In these cases, it must always be supported. It's always best to assume the worst and add proper support on any extension over 6". An unsupported span of no more than 36" is usually acceptable as long as the stone is supported on both sides of the span. Most counters are installed with a standard overhang of 1" with a standard or custom edge. A special edge creates an additional installation challenge and usually results in extra cost. See prices of special edges here. Dishwashers should not be attached directly to the granite countertop, but be side-mounted to adjoining cabinets. Special brackets are available from the dishwasher manufacturer for this purpose. Drilling into the bottom of the stone can cause stress cracks and discoloration in the surface of the stone.